New York City has been the font of inspiration for myriad artistic pursuits. Book after book has increased visibility to a variety of offbeat subjects: from the city’s gargoyles to its green space fountains; from the rats of the sewer systems to the beauty of the Central Park bridges. There is even a book about the structures and buildings that were designed but were not even built. Now, One-Track Mind joins this dynamic array. Essentially, for this project, Bookstein and Workman have served as curators of Coppola’s research and artwork, extracting excerpts from thousands of sketches, 41 journals, and years of fact gathering. If they had included everything, surely this would be a massive multi-volume series. Actually, a multi-volume encyclopedia is just the project Coppola envisioned in 1978 when he began to draw the decorative elements of each subway station. Coppola recognized the artistic value and historic significance of these overlooked and mistreated treasures and was compelled into action. In 1894 New York Governor Roswell P. Flower signed the Rapid Transit Act that mandated a cohesive inter-borough subway system. Developed in phases, the first phase broke ground in 1900. Over its years of development, the project became the quintessential showcase for the Gilded Age of art and design for the City Beautiful movement in America. Seven decades later, as the decorative pieces came into disrepair and stations became outdated, they were covered over or dismantled altogether. Coppola, a native raised in Maplewood, NJ, took it upon himself to document as many of the designs as possible before they became forgotten or destroyed. Using his artistic talents and publishing/printing background, he quietly self-published a six-volume set titled Silver Connections (1984). Instead of thousands of pages, One-Track Mind is a diminutive selection presented in a single neat and tidy 5x7 package. 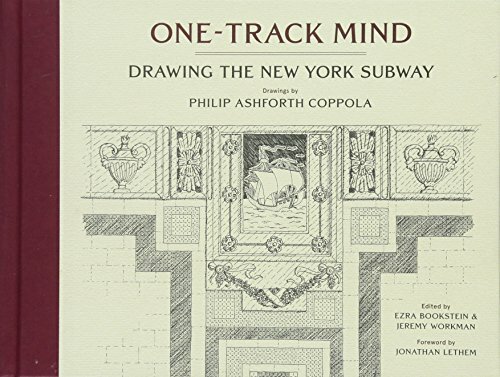 It begins with a section of Coppola’s hand drawn maps of the subways transit layout for Contract 1 (1905 Manhattan-Bronx line) and Contract 2 (1908 Brooklyn line) and ends with reproductions of a few original journal pages. In between are station drawings that range from full elevations and rooflines, to tiny railing designs, name panels, pilasters, corbels, fixtures, and more. Coppola drew the intricate details of these strips, frames, and other elements with meticulous notes about measurements and color schemes. Many pages are dotted with tiny notations about viridian, buff, olive, cobalt, and sienna hues as well as materials such as marble, mosaic, or terra-cotta. On every page, the reader will appreciate the artist’s painstaking efforts and his patient commitment to his mission. What is missing, though, is the grand sense of scale that the subway stations, and the artwork itself, possess. It is almost impossible to feel the massive heights (or depths, really, upwards of 180 feet underground) or the magnitude of some of these structures. One can catch a glimpse of this majesty in the scant handful of completed full-station illustrations, but with the majority of the detail drawings, this is lost. All of the measurements have been omitted. Another feature that could have made a significant impact would have been to include even one full color illustration. Coppola went to the trouble of indicating which color went where for almost every drawing. An example of these colors would have been exciting to see in one form or another, if only in a wreath or rosette. Coppola has single-handedly documented a monumental public subway system, a project that took hundreds of professionals and artisans to create. One-Track Mind demonstrates just how impressive one man’s private life-time passion can be. It is a classy tribute to a dedicated and determined artist.